Hardy Kruger was born in Berlin on April 12, 1928. He has worked in films the whole world over, performed on stage and has written a great many books. During the first two decades after World War II, he and Hildegard Knef (known as Hildegarde Neff in the USA) were the only German actors who performed on Broadway. When no one wanted to see an actor from a country that had brought death and ruins to the people of this world, Hardy was the first German ever to play leading roles in motion pictures to be filmed in London, Paris, Sydney, Moscow, Stockholm and Hollywood. In 1957 the British Press Corps declared him ambassador of his country. 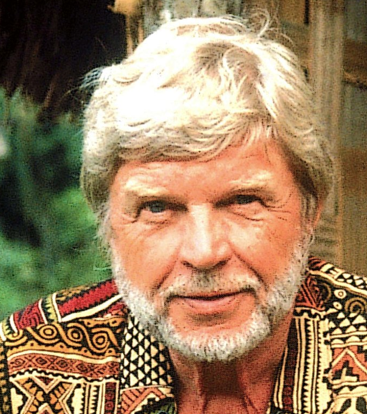 During the sixties and seventies Hardy Kruger lived on his farm at the foot of Mount Kilimanjaro. In 1962, the French motion picture Les Dimanches de Ville d'Avrey (Sundays and Cybele), for which Sam Spiegel, on Kruger's request, provided 75% of the budget, and with Hardy in the lead, the film was awarded the Oscar for best foreign film. In the eighties he devoted ten years of his life to writing stories with a television camera about people on all five continents, and on the sixth one too: Antarctica. His 35 episodes of love, understanding, gods and tolerance are regarded as classics in Germany. The list of movie greats he was honored to play opposite reads like a Who's Who of the Unforgettable: James Stewart, John Wayne, Charles Aznavour, Cathérine Deneuve, Yul Brynner, Richard Burton, Orson Welles, Claudia Cardinale, Sean Connery, Melina Mercouri and Richard Attenborough, to name just a few. In 2001, Hardy Kruger was made an Officer of the French Legion of Honor, a distinction only one other German actor shares with him: Marlene Dietrich. The president of his own country honored him with the Grand Cross of the Order of Merit. The awards for his work in motion pictures include the Prix Femina Universal, the Bavarian Film Prize, Le Grand Prix National du Cinema Français, Germany’s Golden Camera and Bambi, the Jupiter 2011 and the Bundesfilmpreis (national award of the Federal Republic). From early marriages, there are three children. Two of them, Christiane and Hardy Junior, have become well-known actors in Germany, performing on stage, in films and on television. Hardy Kruger has been married for thirty-five years to Anita Park, an American photographer and writer. The two make their home in both California and Germany.